Plattsburg is friendly to speeders. They will generally amend a ticket to a defective equipment. A defective equipment is a non-moving violation that will not appear on your driving record and will result in no points on your record. A defective equipment in Plattsburg costs between $150.00 and $275.00. Plattsburg holds evening court on the first Thursday of every month. Historic Plattsburg, Missouri is a quaint town of 2,200 people located just 35 miles north of Kansas City and 25 miles south of St. Joseph. Founded in 1833, the town of Plattsburg is a source to a great amount of history. Always considered a cultural town, Plattsburg once hosted the Chautauqua Indian Tribe, housed Plattsburg College, and an opera house. Most of Plattsburg’s Antebellum homes were torn down and replaced by Victorian homes. Today, it’s stately Victorian homes are being restored to their original grandeur. Downtown Plattsburg is enjoying a renaissance with nearly every storefront filled. 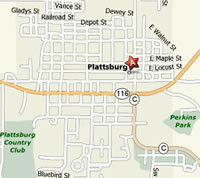 Plattsburg is 175 years old this year (2008). Back in 1833 the city and it’s county (Clinton) came into existance. Plattsburg is proud of it’s heritage which includes our beautiful historic homes and President for a Day, David Rice Atchison.